I have to share this quick story* from the weekend (sorry, tonight is the first time I’ve had computer access in a whole. I predict you all will be hearing increasingly less from me as final near since Ducks is never home and thus the path of blogging is obscured for me!). 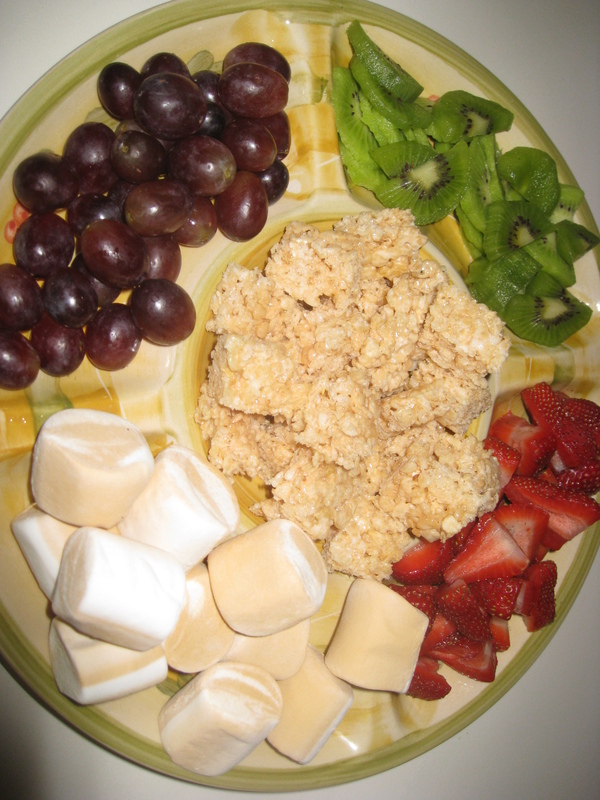 And fondue (actual fondue not pictured – just the dippers)! I made the fondue with a mix of white chocolate and semi-sweet chocolate – after the guests left, I had to restrain myself from sitting down with the fondue pot and a spoon and disgracing myself. I would also like to point out that, since receiving it as a wedding gift, I have now used my fondue pot precisely two times. Actually three if you count my ill-fated attempt to use it to melt chocolate to make oreo truffles. But, the less said about that, the better. Anyway, the point of this post. Christi was supposed to arrive at my house at noon to set up the jewelry and L was coming at 1 to help me get things ready and put on the final touches for the party at 2. Sent Christi a text and said, “I’m going upstairs to get ready. Door’s unlocked. Come in when you get here.” Went upstairs, got ready, came back downstairs, fidgeted for a while, then checked the time again. Almost 1. Almost time for L to arrive. Watched some TV, worked on my story I’m writing for NaNoWriMo. Fidgeted some more. Looked up the recipe for fondue that I’d misplaced. Got out ingredients and simmered them in fondue pot. Still no friends. 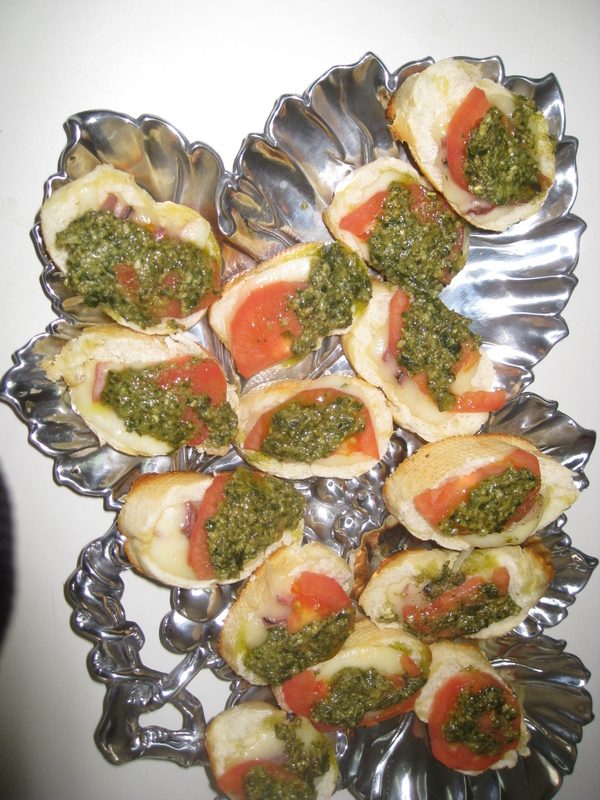 Assembled bruschetta. Still no friends. Began to feel very sorry for self. Resisted urge to text L and tell her to hurry. Put bruschetta in oven to warm. Took out all nice and crispy. Started getting mad at friends for betraying me. So, turns out my friends are good friends after all. And, that my iPhone is a tricky little jerk. In the morning before Ducks left for the library, both our phones were showing the same time – the fall back time. I swear they were. At some point between his departure and 1:59 p.m., they switched back. Sigh. But the party was fun and I ended up with some free jewelry for all that. So, all’s well that ends well, especially if it ends with chocolate fondue, my friends. 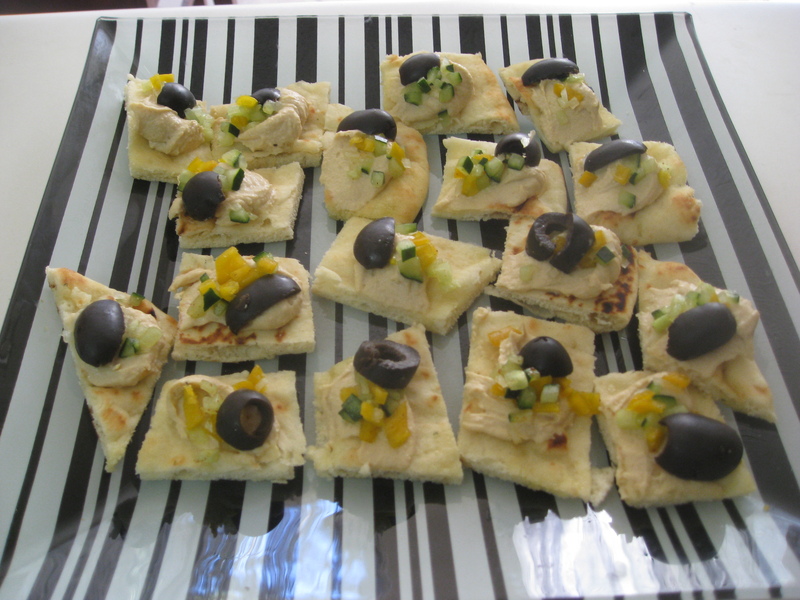 This entry was posted in friends, Fun with Food, Just funny and tagged bruschetta, chocolate, daylight saving time, fall back, fondue, hostess, hummus, jewelry, jewelry party. Bookmark the permalink. I am so freaking hungry after looking at this. Also my fiance slept until 1pm on Sunday. WITH DAYLIGHT SAVINGS. Rationale? There was no 1pm football to get ready for. Really. Also… I feel your pain about the time change mishap. Once I missed a bus in Spain by forgetting daylight savings time in the spring. And when I showed up an hour late to the station, a crazy old man came up to me and starting pointing at his watch and laughing. Not cool. As I was reading, i was afraid that you had the wrong weekend and made all the food for nothing. haha I’m glad it all worked out. (And yes, at least this Northener, has eaten and LOVES queso! I like your munchy choices. Simple, healthy, but not the same old chips and dip. You’ve inspired me for my pampering party (which I would love for you to come to if you can). Hehehe…..funny. Glad I’m not the only one! I will definitely come to the party (as we discussed earlier — side note: aren’t the rest of you “totes jells” as my sister Beth would say, that Abbey and I are having in person conversations about parties? You should be!)! Yum! Please cyber send some of those snacks over. I have yet to use a mini fondue set but yes, I should totally use them for a party! I had to be at work at 8 a.m. Sunday, and was so afraid something would go wrong with my cell phone and the time change and I’d be there way too early. (Nick and I use our cell phones as alarms.) Luckily both our phones swapped over normally. We use our cell phones as alarms too…this morning, I was off work and forgot to turn off my alarm. 😦 But it turned out to be okay because my dad called me at 6:30 to discuss the football game this weekend. Potato chips dipped in chocolate sounds AMAZING! I love the combination of chocolate and saltiness (NTNW must have sensed that when she sent me a bag of chocolate pretzels). Speaking of which, I put your prize in the mail yesterday….FINALLY!